ASHRAE compliance is sweeping the nation! 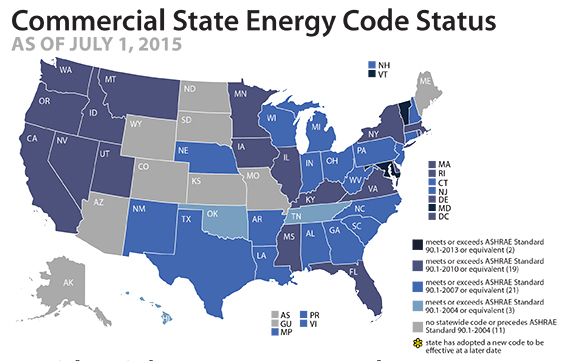 As of July 2015, 41 out of 50 states have adopted energy code requirements that meet or exceed ASHRAE 90.1, a set of national recommendations that give states and local municipalities guidelines for writing their own energy codes. The guidelines provide minimum requirements for energy efficient design of most buildings in new construction and retrofit phases. In order to understand the new requirements, we’ve broken down the standards into bite-sized, easy-to-understand quick takes. Consider this your crash course in ASHRAE 90.1 requirements and how they apply to your business. 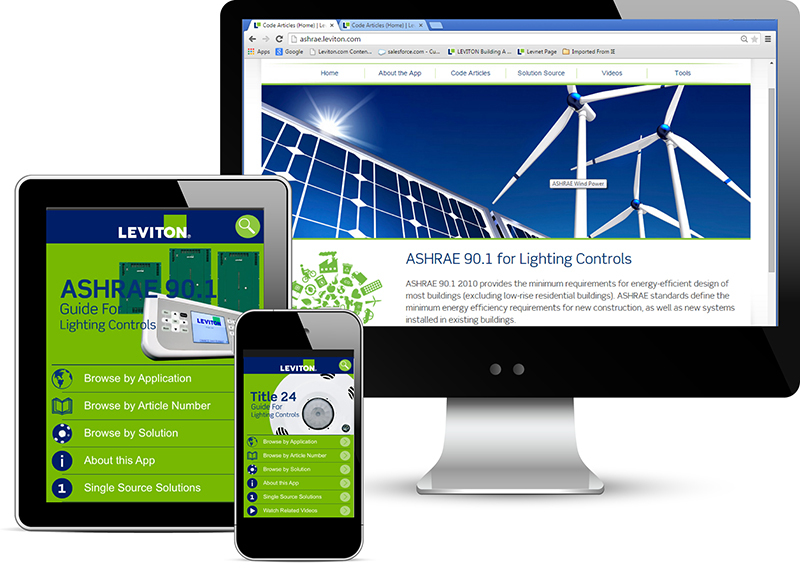 For more on-the-go ASHRAE 90.1 information, be sure to download our ASHRAE 90.1 app for your tablet or smartphone: Leviton.com/apps. 50% of all receptacles in private offices, open offices and computer classrooms must be controlled by an occupancy sensor. Leviton Marked “Controlled” Receptacles comply with all ASHRAE 90.1 requirements, and are marked CONTROLLED to differentiate them from non-controlled outlets. Visit Leviton.com/receptaclecontrol to learn more and to order. Interior lighting must have an automatic control to turn the lights OFF. The device can be a scheduling control, an occupancy sensor, or a BAS/BMS system signal. Parking garage lighting zones must be controlled by a device that reduces power by 30% after 30 minutes of vacancy, and open exterior walls must utilize automatic daylight harvesting. Sidelit (areas with windows that let in light through the side of the building) and toplit (areas with skylights that let in light through the top of the building) must be separately controlled by a photocontrol, which can be stepped or continuous dimming. Calibration cannot be located on the photocell, so that adjustments are simple and accessible. 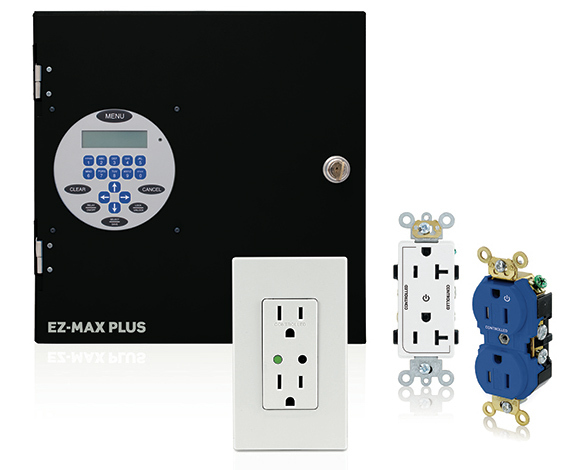 Separate controls are required for special applications (displays, hotel guest rooms, tasks and stairwell lighting). See the code for more details. Exterior lighting must be controlled by a photocell to turn lighting OFF when sufficient daylight is available, and reduce advertising/sign lighting power by 30% during closing. More controls are required in every project. Manual-ON (vacancy sensors) or auto-ON (occupancy sensors) that activate lighting to no more than 50% of full bright must be installed (with many exceptions). See the code for more details. All lighting controls must be tested by a party not involved with the design or construction team to ensure that the products are working properly. All Leviton solutions are manufactured to the highest quality and performance standards, which can be easily demonstrated at the time of installation to fulfill this ASHRAE 90.1 requirement. 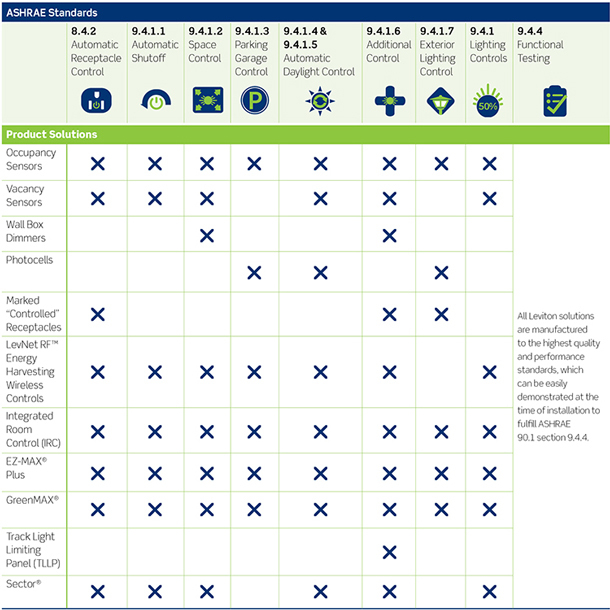 Picking the right Leviton solution is a breeze with our ASHRAE Product Selection Chart. Mix and match to meet your business’s unique needs. This information is for informational purposes only. Each project will have its own specific requirements for satisfying ASHRAE Standard 90.1 2010 code compliance based on a variety of factors. Other exceptions or details may apply. 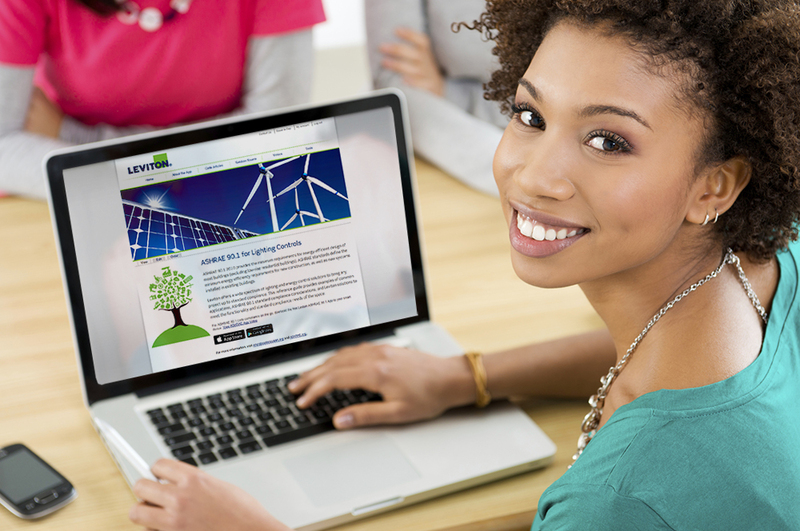 Review the code for specific requirements and/or consult with a professional advisor. Leviton Mfg. Co., Inc. is not responsible for any loss resulting from the use of any information found in this article.